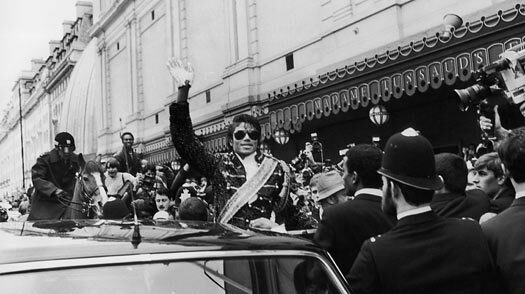 Michael Jackson arrives at London England's Madame Tussaud's Waxwork Museum to unveil his sculpture in 1985. Each succeeding Thriller video was more elaborate than the last, expanding in length and complexity. The title video ran nearly 14 min., with the song encased in a narrative that had Michael and his screen girlfriend (Ola Ray) watching a horror movie that comes to life  or rather, undeath. Surrounded in the woods by zombies, Michael becomes one of them, leading the creatures in choreography that would have exhausted any living being. When it appeared Jackson could simply get no bigger, he divided his talent into 45 little parts and shared it. Inspired by Bob Geldof's Band Aid, Jackson and Lionel Richie co-wrote 1985's "We Are the World," which raised millions for famine relief in Africa and, on the night of the American Music Awards, brought together almost every major pop singer in America in a Los Angeles recording studio. Parts of "We Are the World" have aged poorly (the whole thing went from idea to recording in just 12 hours), but the composition itself is a wonder  flexible enough to deliver a serious message and accommodate the vocal styles of everyone from Kenny Rogers to Bob Dylan. And when Jackson sings the bridge, it's a classic, "'scuse me, genius coming through" moment. His style  so clear and urgent  tops them all. Any groundbreaking performer in the rock era is lucky to have a few transcendent summers. The magic amalgam of a star's creativity and an audience's rapture can evaporate after two years with, say, an Army induction (Elvis) or after four with a motorcycle accident (Dylan). Sometimes, just turning 25 will do it (Brian Wilson). Madonna lasted longer because she was the Mistress of Makeover. Most find it hard to maintain either popularity or emotional equilibrium. And the brighter they burn, the faster they burn out. Jackson, as we know, hung around, adding notoriety to his fame and descending, to put it gently, into curio status. But even another two decades of steady hits would have been a decline from the fever pitch of Thriller. The album marked a moment in American history that few singers dream of, let alone achieve: the convergence of talent, material and production that finds universal acclaim. That's part of what makes Jackson's death so historic: he was one of the last singers  Paul McCartney is another  whose songs are literally known everywhere by everyone. Thriller and "We Are the World" and his introduction of his signature step, the moonwalk, on the Motown 25th-anniversary show took Jackson to an unfathomable level of fame. Jackson was more than a crossover artist, but cross over he did. He was revered by kids black and white  authentic enough to please urban audiences and unthreatening enough to set suburban ones at ease. He was adopted as a cause by Nancy Reagan (they both liked red) but, despite "We Are the World," was shrewd enough to keep his politics to himself. Still, he showed a succession of African-American cultural figures how to transcend race  Michael Jordan, Tiger Woods, Oprah Winfrey and, finally, Barack Obama. Michael was neither black nor white; he was sui generis, a brother from another planet. Even as he cranked out another huge record  1987's Bad, still the only album in history to generate five No. 1 hits  he began to antagonize those who worshipped him. As he added a cleft to his chin and bleach to his face, as his cheekbones got higher and his nose keener, as he sat at a press conference next to Bubbles the chimp and hung out in public with Macaulay Culkin, the love and respect millions felt for Michael got more ... complicated. The kid was adorable. The young man was a thriller. The older man, who clung to a dangerously naive belief in childhood innocence, was in trouble. See TIME's 1984 cover on Michael Jackson.